How often has this happened in your practice? You submit an insurance claim, only to receive a denial, labeling the treatment or diagnostic testing you conducted as "observational" or "investigational." It's a response familiar to many doctors of chiropractic. "This is happening so frequently now," says Charles Herring, DC, president of the Foundation for Chiropractic Education and Research (FCER). "Someone representing the insurance company does a literature search and writes up a policy position stating that X is not a covered benefit, because it's been determined from the literature [to be] an observational or investigational service." These documents, usually called "clinical policy bulletins," mean that even before your claim can be considered, you have to come up with scientific literature to effectively counter the insurance company's ruling. That's why it's more important than ever for today's doctor of chiropractic to keep up with the scientific literature. "Evidence-based health care is the paradigm now. But it's also being abused by third-party payers, who don't always appropriately apply evidence in the patient's best interest," says Bill Meeker, DC, president of Palmer College of Chiropractic West in San Jose, Calif. "An insurance company may misquote evidence, take it out of context, or apply it unfairly across providers, patients or plans." "In Ohio in particular, we are constantly teaching our doctors how to counter the arguments of [insurance companies] consultants, who are using outdated thinking and research, and misapplying them to clinical practice," says Ronald Farabaugh, DC. Dr. Farabaugh is the founder of the Medical Referral System, a program that helps DCs generate referrals from other healthcare specialists, and he practices in Columbus, Ohio. "For example, I hear all the time from consultants who deny care because of concerns about physician dependency. But if you look at the literature, when it comes to chiropractic manipulation, there is none," he says. "Another issue is the insistence that soft-tissue injuries should have healed after six to eight weeks. But dozens of papers show that many times soft-tissue injuries progress to a chronic pain state. 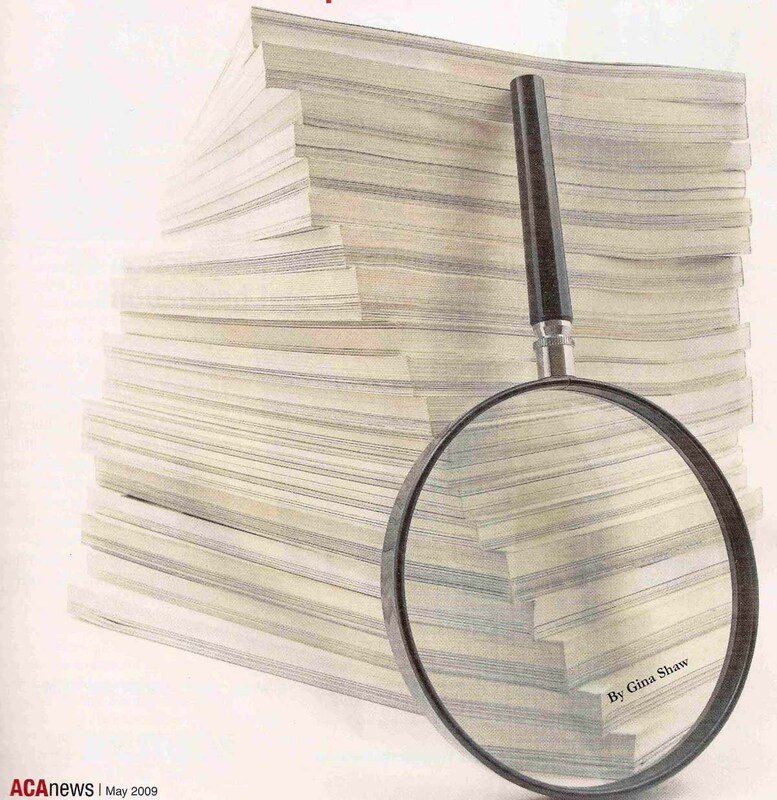 If you know the literature, you can send it right back to [the insurer]," says Dr. Farabaugh. Fortunately, it's easier than ever before to make the evidence work for you-not against you. Searches that once required day-long trips to a medical library can now be conducted online with just a few mouse clicks. Indeed, says Dr. Meeker, keeping abreast of current research is a professional responsibility for the con-temporary doctor of chiropractic. "Start keeping up with what's going on. It hasn't been acculturated in the profession until recently, but you have to stay abreast of the literature. That's what's driving decisions, and if you are well armed, you'll do better than those who aren't." Mark Dehen, DC, chair of the Council on Chiropractic Guidelines and Practice Parameters (CCGPP), recently encountered just such a situation in his North Mankato, Minn., practice with a patient who was experiencing the neck, low-back pain and headaches typical after an auto accident. "After the usual course of care, the patient was doing well but still had some complaints," says Dr. Dehen. "Her care was eventually denied by the insurance company, and we went to mediation, in which an independent medical examiner decided that all her symptoms were the result of previously existing fibromyalgia, rather than the accident." The patient had never been diagnosed with fibromyalgia, and Dr. Dehen conducted a literature search. He found several articles indicating that motor vehicle trauma actually appears capable of triggering fibromyalgia-not through direct biomechanical injury- but as a stressor that can, in concert with other factors, result in the development of chronic widespread pain. "In my report to the patient's attorney, I explained that the fibromyalgia may be a legitimate diagnosis, but either it was a result of the collision, or the collision exacerbated previously undiagnosed fibromyalgia," he says. "The attorney won the case, I got paid, and the patient got coverage and wasn't saddled with the bill from my office. It took me about 20 minutes on PubMed to pull up the articles that won the case." In his role with CCGPP, Dr. Dehen is particularly knowledgeable of and current with the scientific literature. But even if you're not, in many cases, the work of searching and synthesizing the literature has already been done for you-you just need to know where to look. The findings of the Bone and Joint Decade 2000-2010 Task Force on Neck Pain, released in 2008 in a special supplement to the journal Spine 2008 (Feb 15); 33 4S :S3. The monograph resulted from six years of review of published neck pain research, including almost 32,000 research citations and more than 1,000 relevant studies. "This is very exciting research," says Dr. Meeker. "For example, it's been somewhat accepted that chiropractic adjustments are only good for acute back pain, but not for chronic back pain. But the monograph published in Spine finds that there is just as much randomized controlled evidence for the effectiveness of adjustments in chronic back pain." These major literature syntheses have also led to the over-turning of entire insurance company policies-not just changes for individual doctors. In September 2007, the insurance giant United Healthcare (UHC) issued a policy denying chiropractic coverage for pediatric cases and headaches. CCGPP gathered its literature syntheses, conducted additional searches and pulled together commentary from experts in the field for a letter to UHC, signed by key stakeholder organizations, including the ACA. "A month later, we received our response: United was suspending both of those policies," says Dr. Dehen. "In February 2008, the company retracted the pediatric policy altogether and reworked the headache policy to allow chiropractic coverage." Similarly, a CCGPP synthesis helped to address a workers' compensation crisis in California, which was severely limiting chiropractic care for injured workers through the aggressive application of utilization reviews. "Using a synthesis, we demonstrated that chiropractic manipulation is appropriate for all phases of low-back pain, and used expert opinion to bolster [the points] where the evidence was weak," says Dr. Dehen. ''As a result, California's Occupational Disability guidelines have been modified, effectively raising the amount of chiropractic coverage allowed-with proper documentation-from 12 to 24 visits a year." This spring, CCGPP plans to issue its neck report endorsing the Bone and Joint Decade 2000-2010 Task Force on Neck Pain, as well as an original thoracic literature synthesis. (Visit www. ccgpp.org for links to all published documents and outstanding reports.) Using the CCGPP guidelines published in JMPT, Dr. Farabaugh was able to show a local doctor of chiropractic how to increase his clinical income by $58,000 annually. "This is just by using good quality case management recommended in that pa-per-such as [conducting] proper exams at the proper times and recommending proper exercises at the proper times," he says. Doctors of chiropractic can also keep up with the literature by attending meetings such as the ACC- RAC; FCER's Research Congress; the North American Spine Society annual meeting, which brings together specialists ranging from neurosurgeons and radiologists to physiatrists, doctors of chiropractic and pain management specialists; and the Integrative Healthcare Symposium-an extensive expo on integrative and complementary medicine. Dr. Meeker also recommends subscribing to JMPT, Spine, the Spine Journal and Manual Medicine. "DCConsult will help doctors of chiropractic quickly locate the most-current abstracts and information. Search results of-ten include articles the same day they are published-and the literature searches are easy and, most important, accurate," says Dr. Herring. "More search capabilities are added weekly and include Merck Manual and other diagnostic tools. Soon doctors will be able to access tutorials, educational programs, nutritional approaches, and information on techniques and more," he adds. "Evidence-based chiropractic makes sense from an economic standpoint, a referral standpoint and a case management standpoint," says Dr. Farabaugh. "It's all about trying to secure a better outcome for your patient, and I don't know how you do that if you're not up on the literature."